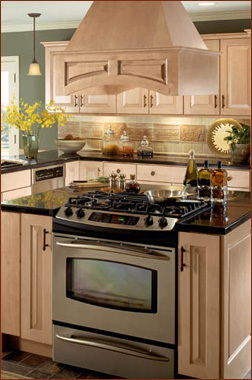 Homeowners trust the Kitchens By Hastings name to deliver expertise and craftsmanship in kitchen remodeling. That’s why we carry and install luxury appliances by Wolf and Sub Zero, as well as kitchen fixtures by Kohler and Franke. These companies have a reputation for distinction. We trust them to carry on our tradition of quality. Wine storage, minibar and under-counter refrigeration additions sure to add opulence and convenience to any room of your house. Built in models and ranges with gas, electric and duel capabilities. These offer flexible design options, convenience and complete control. Features of the gas cook tops include a “true simmer setting” and burners that relight automatically if extinguished. Induction cook tops, which are fast and energy efficient. Integrated modules that offer energy options for both gas and electric. Ventilation options which exemplify utilitarian beauty, offering halogen lighting and fans to remove smoke and odors, while remaining easy to clean. Wolf also offers microwaves, warming draws and grills because the details make all the difference. Your new kitchen deserves fixtures that add to its beauty and custom design. Nothing says “style” like the Kohler and Franke brands. Sinks and faucets with your professional, entertainment and everyday needs in mind. Their “Caviar” models are unique because of the soft, textural, warm-gray look that hides water spots and lends elegance to your kitchen when paired with stainless steel and granite! Combine form with function to produce eye catching designs that are both durable and versatile. Their sculpted sinks are made of stainless steel or fire clay ceramic and come in many shapes and sizes. Their faucets, which boast solid brass construction, can be ordered in a spectrum of colors and finishes. If your project needs another brand to create the look that you want, we are happy to accommodate any need you may have. Kitchens By Hastings will install the right appliances and fixtures to create your custom kitchen look.